Couldn't find your answer? Just send an email to our customer support team. We'll get back to you within 24 hours! What types of videos will I find on Grokker? What are the different plans available for Grokker? Why is my video slow/choppy? 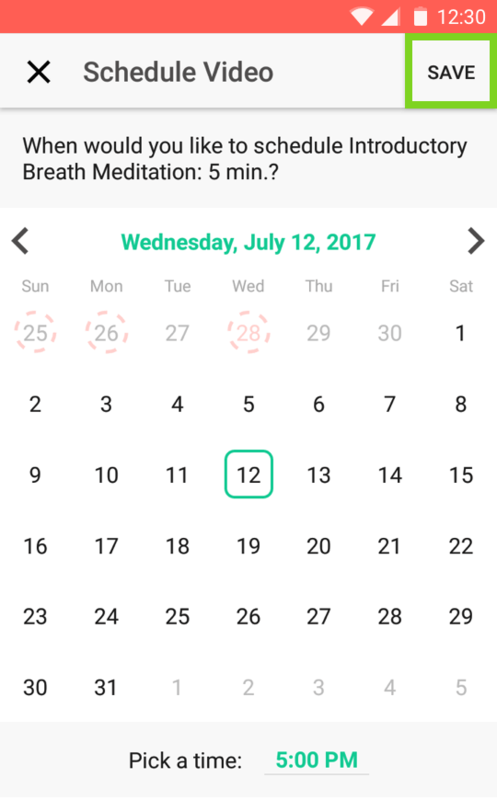 What are Wellness Minutes, and how do I use them to track my progress? How do I earn Wellness Minutes? How are Wellness Minutes levels defined? How do I add a video to my calendar? How do I add a program to my calendar? How do I update or remove a calendar reminder? How do I use filters to find the perfect video? I love Grokker, how do I share with my friends? What is the follow button for, and why should I follow something? How do I create a collection and add videos to a collection? What is an 'I Did This'? How do I post an 'I Did This'? Which fitness trackers can I use with Grokker? 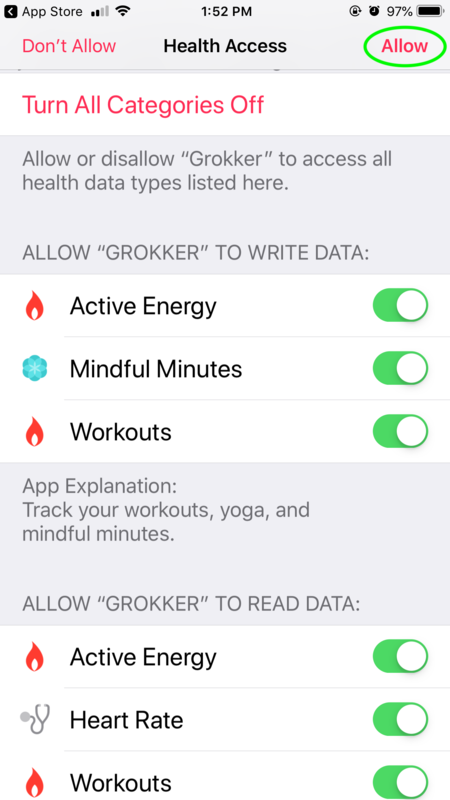 How do I connect my Apple Health with Grokker? 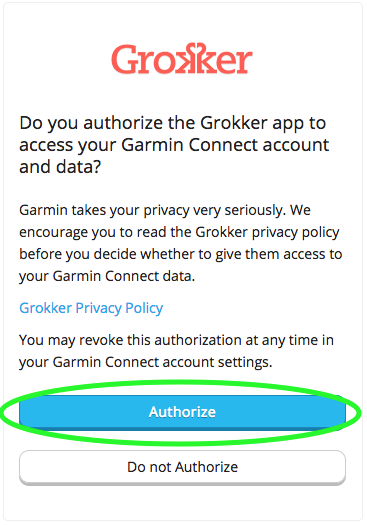 How do I connect my Fitbit or Garmin account with Grokker? What data from my tracker is being used by Grokker? 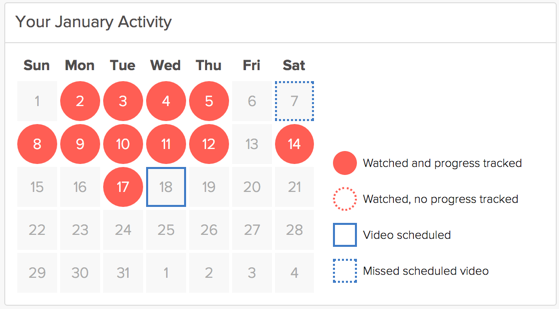 Will I get wellness minutes for activities synced from my tracker? What should I do if my Fitbit or Garmin data does not appear to be syncing with Grokker? How do I disconnect my tracker? How do I update or add payment information? How do I connect Grokker to my TV? How do I change my username and/or email address? How does Search & Filter work? How can I schedule a video to watch later? How do I update or delete a calendar reminder? Where can I find my collections, videos I have scheduled, and videos I've watched recently? How do I subscribe to Grokker? As a Grokker member, you'll have access to thousands of video classes in Yoga, Fitness, Meditation and Cooking. One of the first things you'll notice about our videos is the emphasis we place on quality. The Grokker team has hand-picked expert teachers to produce premium videos that will enlighten you on your journey to becoming a better you! We add new videos all the time and we curate the best videos from around the web into the Grokker library. Grokker Experts star exclusively in Grokker Premium Videos. Learn from James Beard award winning chefs, NCAA athletes, Royal Marines and nationally celebrated yoga instructors. Click on an Expert's avatar to see their bio page and learn more about their interests and specialities. Expert avatars are distinguished by a ring of coral around them. 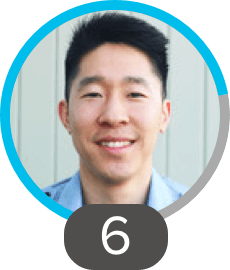 You can @mention an Expert in a comment on their video page to immediately get their attention. Follow as many Grokker Experts as you like and we'll notify you when they release new videos. We currently offer two different plans: Premium Monthly and Premium Annual. $119.88/year for an annual plan, $14.99/month for a monthly plan. There are a number of different reasons why you may be running into video playback issues. Internet connection, browser bandwidth, plug-ins/extensions, or an out of date Flash Player are all factors that could be affecting video playback. There are a few things you can do to optimize your video playback experience. Check your browser: try playing the video on an alternate internet browser (e.g. Google Chrome, Mozilla Firefox, Internet Explorer Safari) and see if the experience is improved. Make sure Flash is up to date: if you're not sure what version you are running, you can check here. To download the most recent version of Flash, click here. Clear cache and cookies: if you need instructions to do so, click here. Change the resolution on the video. 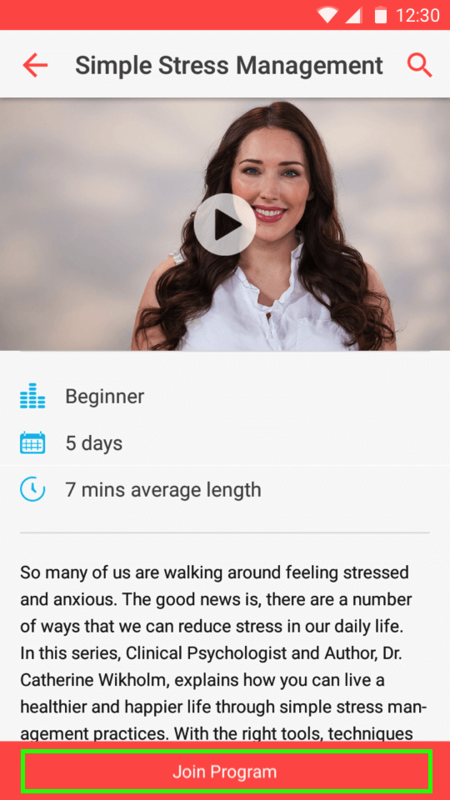 What are Wellness Minutes and how do I use them to track my progress? 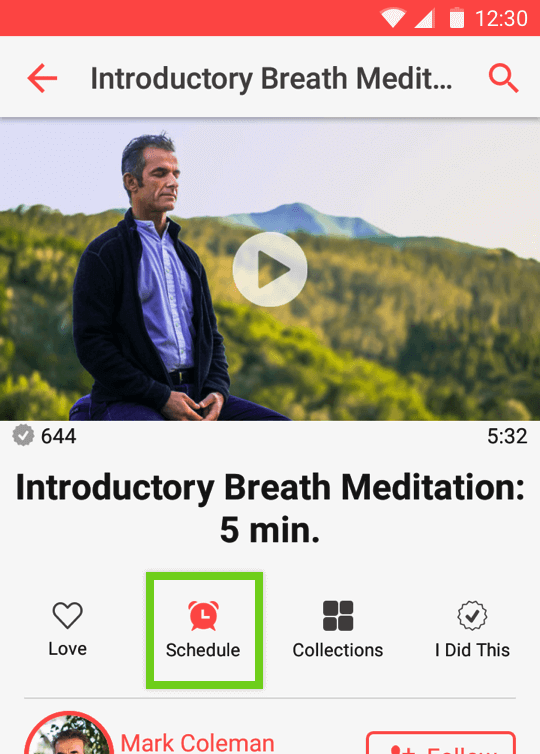 Wellness Minutes reflect how many minutes of video you have watched on Grokker. 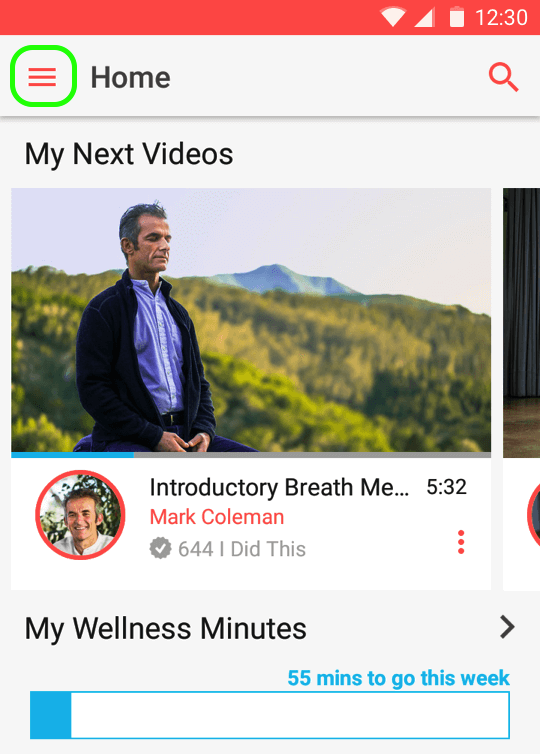 The more videos you watch, the more Wellness Minutes you earn and the higher your level is. Your avatar shows what level of Wellness Minutes you have earned (the number at the bottom of the circle) and how close you are to the next level (how much blue the ring around your avatar is filled with.) Everyone's avatar on Grokker reflects their Wellness Minutes, except for our Experts. Experts' avatars are ringed with a coral color. You can track how many Wellness Minutes you have earned by checking the Wellness Minutes module on the homepage. 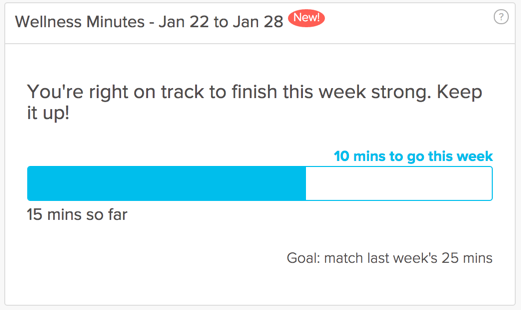 It gets updated every time you watch a video and shows you how many Wellness Minutes you have earned this week compared to last week. 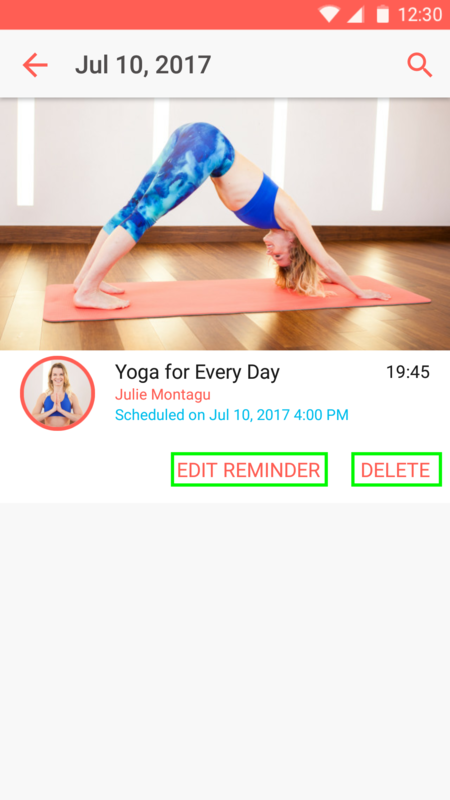 You earn Wellness Minutes automatically, just by watching Grokker videos in any of our apps (iOS, Apple TV, Roku) or on the web. 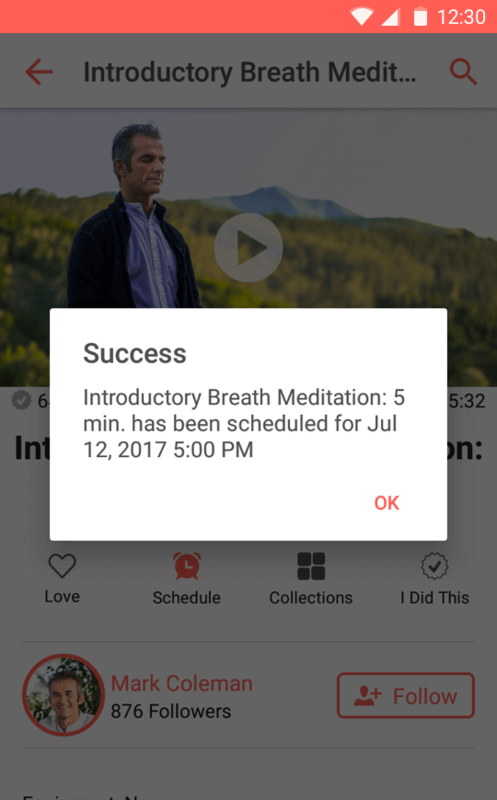 On the web, at the end of watching a video, or if you pause during playback, we will show you how many Wellness Minutes you have earned. How are Wellness Minutes levels determined? The Wellness Minutes level that appears on your avatar is determined by the number of Wellness Minutes you have earned, and which range that falls in in the table below. Select the video you would like to schedule. On the video page you will see a clock icon labeled as "Later". Select this. Follow the instructions to select a time and date based on your preference. Select the "Set Reminder" button. Note: You will receive an email reminder or iOS app reminder 10 minutes before your scheduled video. Click the reminder and it will take you straight to the video page. Go to the program that you are interested in. 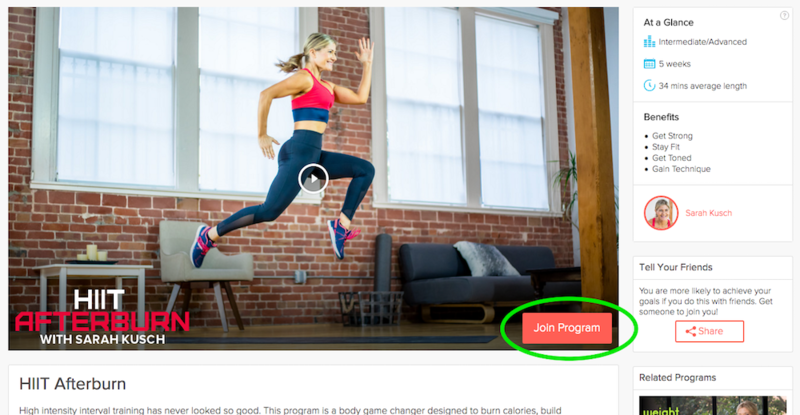 Select the "Join Program" button on the bottom right of the main image. Follow the instructions to select a time and date to start your program based on your preference. 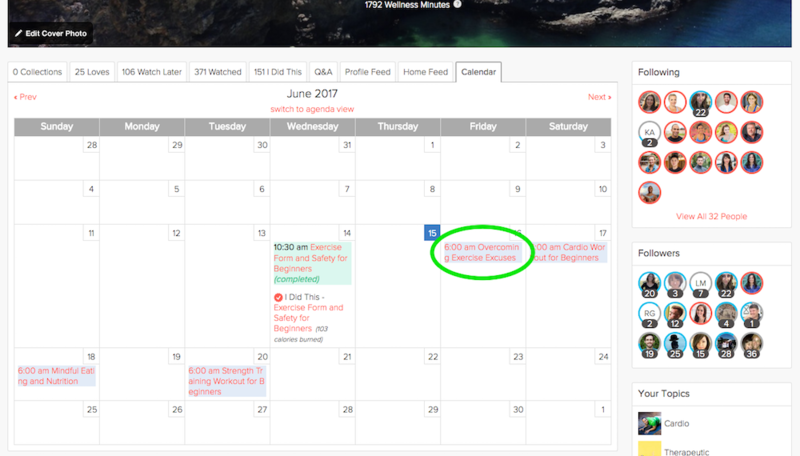 Select the "Add to Calendar" button to confirm. All of the videos in the program will be added to your calendar based on the cadence of the schedule. Note: You will receive an email reminder or iOS app reminder 10 minutes before each scheduled video. Click the reminder and it will take you straight to the video page. Navigate to your profile and select the Calendar tab. Select the scheduled video you would like to update. Choose the new time and date and select "Save" or select "Cancel this Reminder" to delete it. Grokker has thousands of yoga, fitness and cooking videos to help you be a better you. 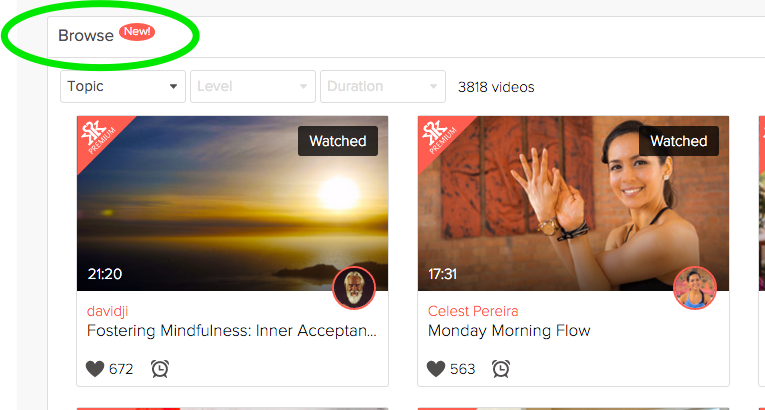 Filtering is a great way to discover your next favorite video. Find the "Browse" area on your homepage. Select the Topic, Level and Duration you are looking for. The videos that appear below match your criteria. Select the "More Options" link to the right to see even more filters you can use. Each Topic has a unique set of filters, so be sure to check them all out. 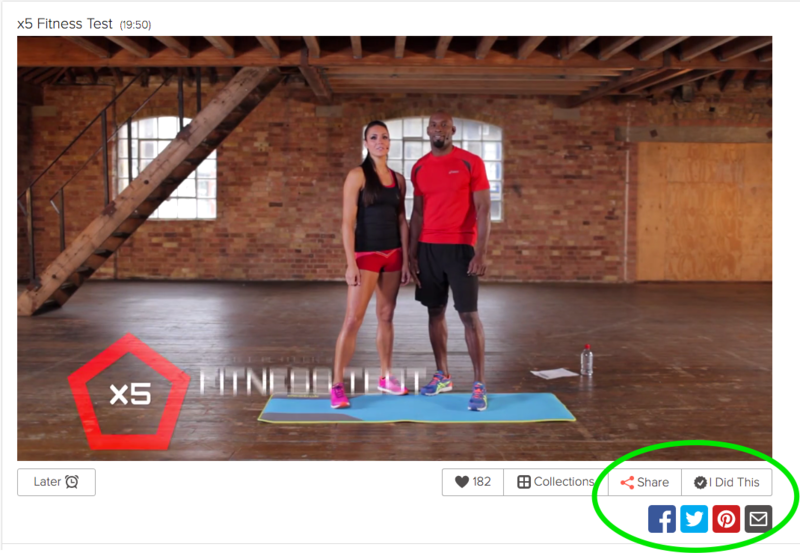 You can share any video through Facebook, Email, Pinterest, or Twitter by clicking on the Share button below the video and selecting the corresponding channel. What is the follow button for and why should I follow something? 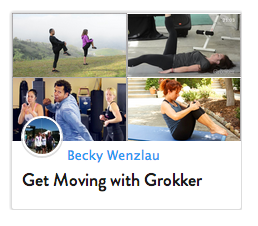 Click the follow button to keep up with new activity on Grokker. 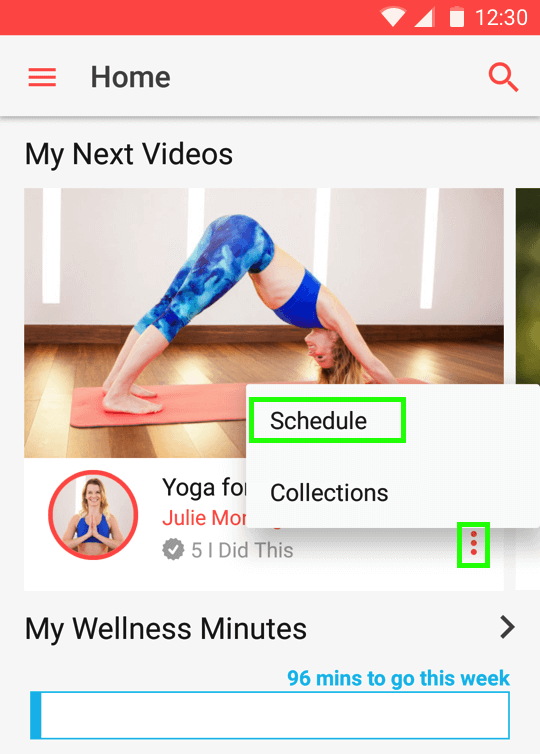 Follow your favorite experts to find out about their new releases, follow topics (like baking, Vinyasa, or cardio) to find out when new videos are added and follow your friends or fellow enthusiasts to find out which videos they love. Visit your profile to see a list of everything you're following on Grokker. What is in my profile, and where can I find it? Visit your profile to see the videos you've watched, loved, saved, topics you're following and much more. Your profile is your personal hub on Grokker. Look for your profile photo in the top right corner, if you're on a mobile device open the menu and click on "your profile." Collections are like video playlists. You can create and share as many collections as you like. To add a video to a collection you should first play the video. Below the video player you will see a button called 'Collections' and when you click this for the first time you will be asked to create a new collection by inserting a title and description. When you click 'Create' the video you were watching will be added to that new collection. When you want to add an additional video to the collection go to the video page for the video that you want to add and click the same 'Collections' button. This will allow you to add the video to the collection previously created. You can find your collections on your profile page. Click on your circular avatar picture in the upper right corner to go to your profile, then click on the 'Collections' tab located directly below your photo. Select the video you would like to add to a collection. Choose either "Create New Collection" or select an existing collection to add the video to. Repeat steps 2 through 4 for all the videos you want to add. What is an "I Did This"? 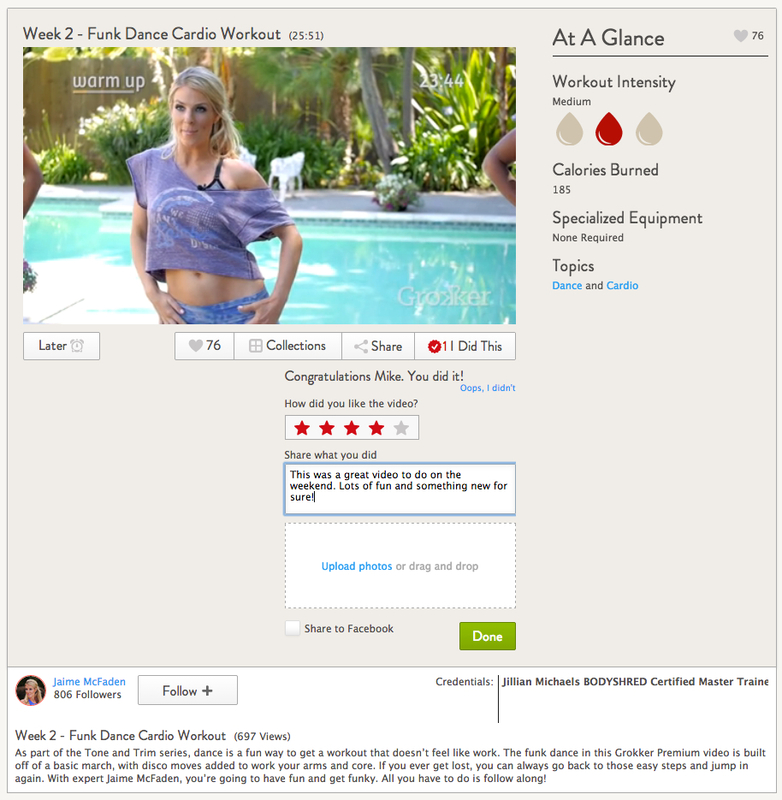 'I Did This' is a way for you to track your progress and to show off your skills and accomplishments to other members on Grokker and Facebook (note that Grokker will never post to any social network without your permission). When you complete a video -- even if you haven't mastered it yet -- use 'I Did This' to indicate that you did that video. This will update your Grokker Calendar which you can see on the homepage or in your profile. Days when you did an "I Did This" will appear as coral colored circles on your calendar. How do I post an "I Did This"? To post an I Did This, navigate to the related video and click on the 'I Did This' button below the video. You'll be asked to rate the video and add some notes about your experience. You may also choose to add photos of yourself mastering the pose or of the finished dish you created. If you want to share your accomplishment with your Facebook friends check the box below the text field to 'Share to Facebook' and click submit. If you don't want to share to Facebook leave the check box blank and click the 'submit' button. You can see all of your 'I Did This' posts on your profile under the 'I Did This' tab. Which fitness apps and trackers can I use with Grokker? 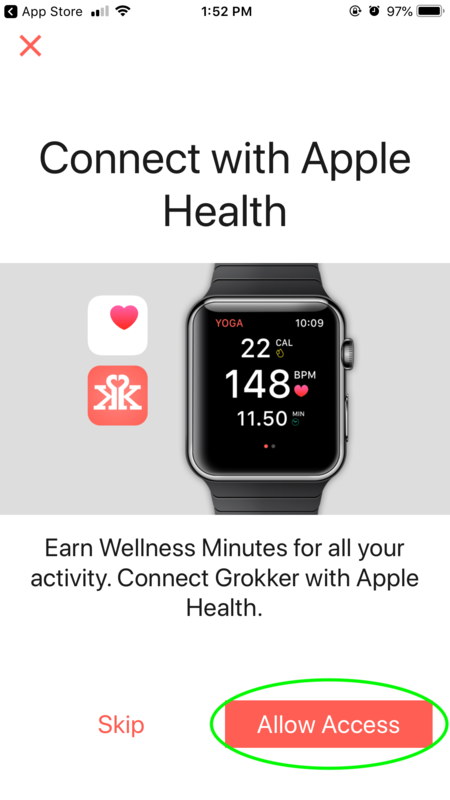 You can connect your Grokker account with Apple Health, Fitbit, and Garmin. How do I connect Apple Health with Grokker? 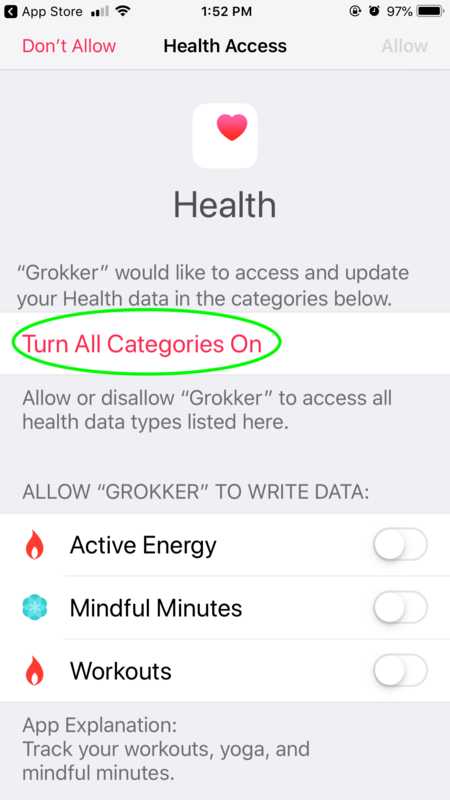 When asked to connect with Apple Health, select "Allow Access"
Select "Turn All Categories On"
It is easy to connect your tracker with Grokker. 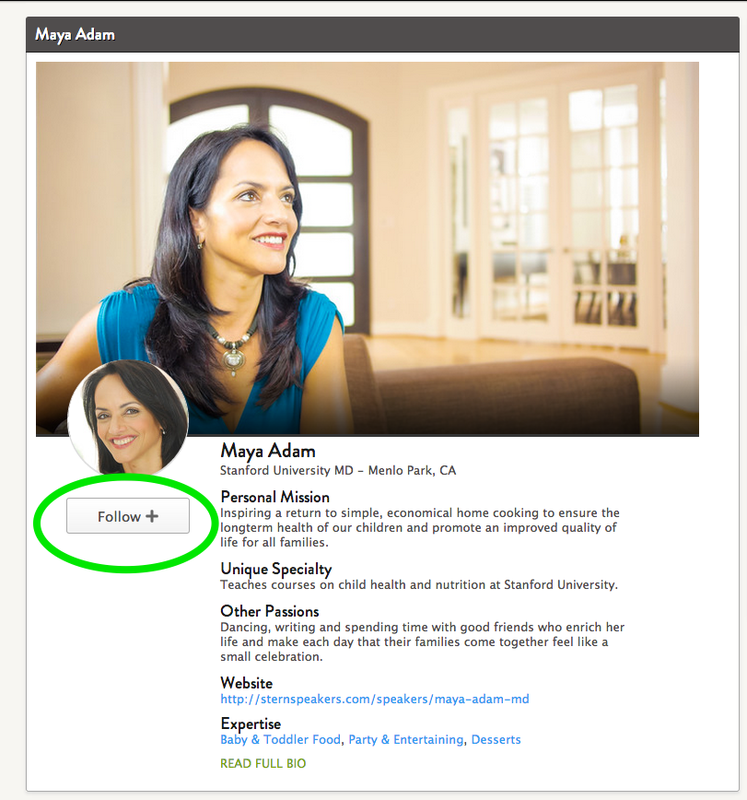 Click the profile icon on the top right corner of the page and select "Account Settings." On the left hand side of the page you will see a section "Connect Accounts"
Select the account you would like to connect with. 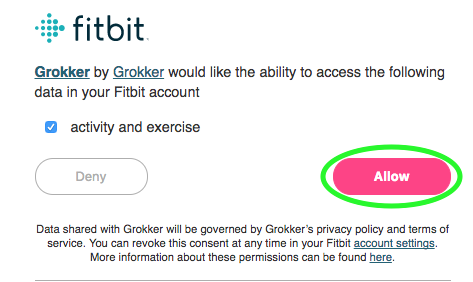 You will be prompted to login to your account and allow Grokker to access your activity and exercise data from your tracker. Select the button to "Allow" or "Authorize". Your Grokker account settings will now show that it is connected with your Fitbit/Garmin account. Where can I see my Apple Health, Fitbit, and Garmin activities on Grokker? We use activity and exercise data from your tracker to determine wellness minutes earned. We do not access any steps, calories, or heart rate data. Will I get Wellness Minutes for activities from Apple Health, Fitbit, and Garmin? Yes! You can earn Wellness Minutes for activities done using your apps and devices. Every activity minute tracked by a device gets you one Wellness Minute. Go to your account settings. Select the link to reload Fitbit/Garmin data. This will start a sync. 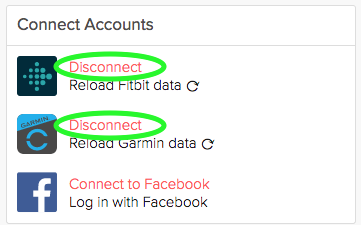 If reloading data doesn't work, disconnect and reconnect with your Fitbit/Garmin account with Grokker. If the above two steps don't solve the issue, please reach out to customer support and we help you troubleshoot. How do I disconnect Apple Health from Grokker? 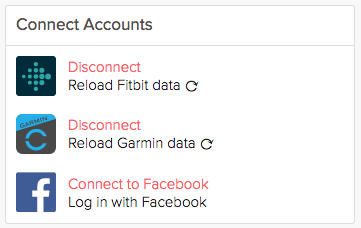 How do I disconnect my Fitbit and Garmin from Grokker? Select the "Disconnect" link for the account you would like to disconnect from Grokker. The tracker will be disconnected from Grokker, and you will see now the link to connect to the device account. If your account is managed by Apple or if you are trying to cancel through our iOS app, please follow these instructions. If you created your account through www.grokker.com, you can cancel your membership at any time from your Account Settings. 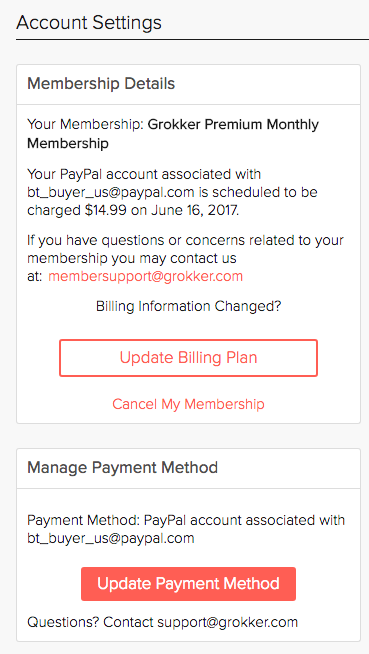 On the left hand side of the page you will see "Cancel my Membership." Click "Cancel my Membership" and follow the instructions. You will immediately receive a confirmation email to the address associated with your account. On the left hand side of the page you will see a button "Update Payment Method"
Select this button and follow the prompts to update your payment information. To change your Account Settings, click on your profile picture at the top right of the page. A menu appears, and you can select Account Settings. Here you'll be able to change your password, connect or disconnect Facebook, and change your email notification preferences. There are a few ways you can use Grokker on your TV. The easiest is through one of our apps for Apple TV or Roku. For more ways check out our blog post for additional information on connecting Grokker to your TV. To manage your email settings, navigate to the Account Settings section in your profile, and click Mange Email Settings. From here you can choose which notifications you no longer wish to receive. How do I change my username and/or email? To change your username, navigate to your account settings by clicking your avatar on the top right corner of your homepage and selecting "Account Settings." Select "Manage Name Settings." From there you can change your username. To change the email address where you receive Grokker email, go to your Account Settings and select "Manage Email Settings." From there you can change your email address. How do I navigate the Android App? Home - Videos recommended for you based on the topics you follow and the videos you watch. My Videos - All the videos you care about. Use the secondary navigation across the top of the screen to select between recently watched videos, saved videos to watch later, videos you have loved, and collections you have created. 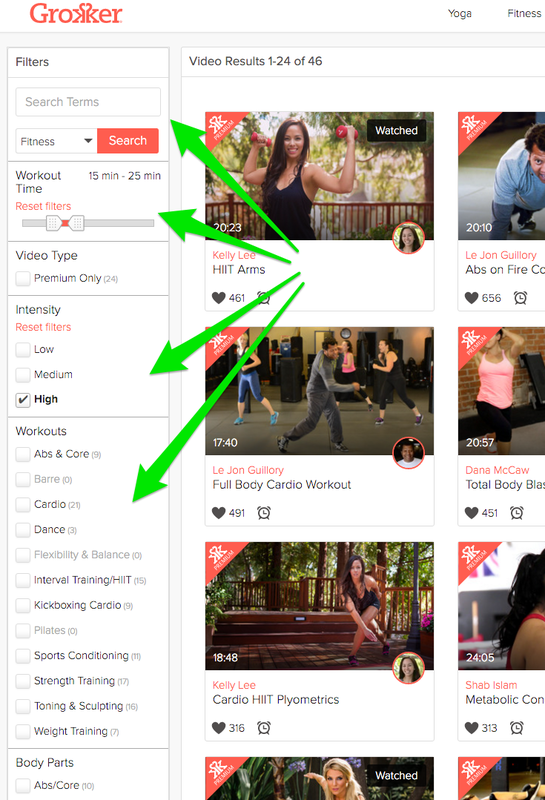 Browse - Choose a category (yoga, fitness, or cooking) in the secondary navigation across the top of the screen to browse videos and subtopics in that category. This area displays the newest videos, trending videos, experts, collections and more. 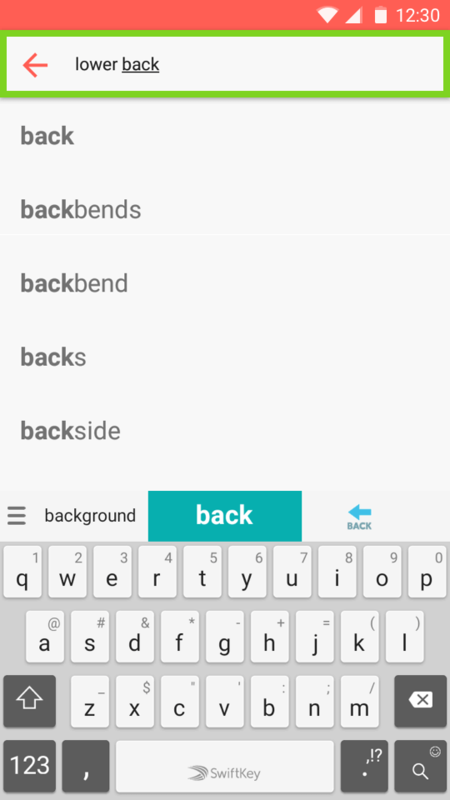 How does Search & Filter work on the Android App? 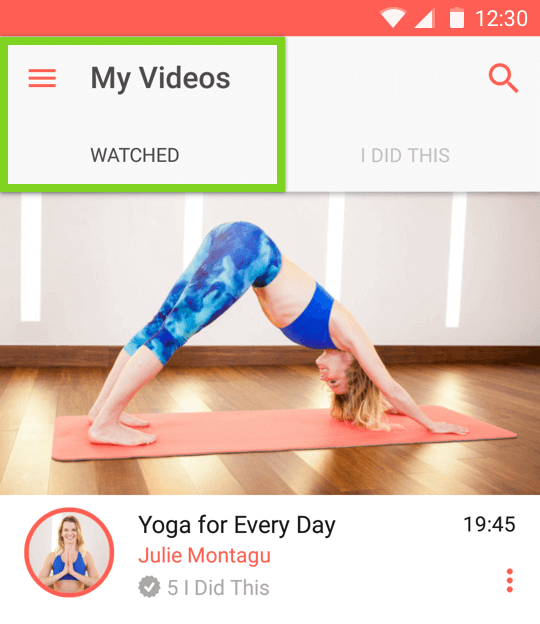 Searching for a video is a common way to find the right yoga, fitness, mind, or cooking video. Tap on the search icon in the navigation. Type in your search query & hit the search icon. 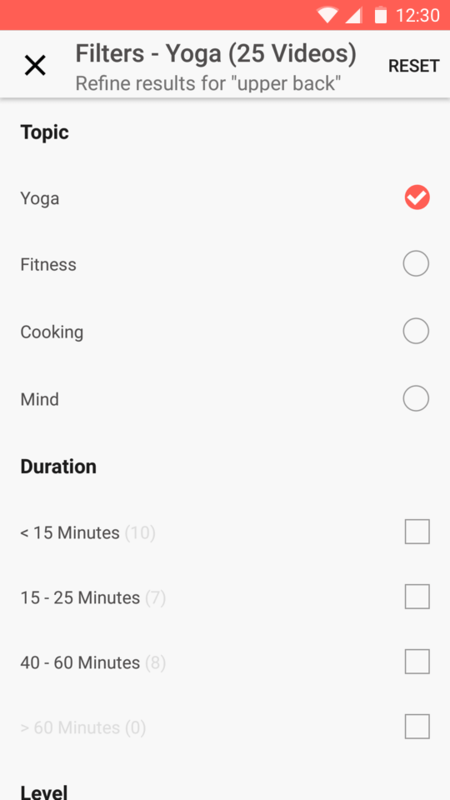 To filter results, tap on "FILTER"
Select the topic you want - yoga, fitness, mind, or cooking. To edit your filter selections tap on "FILTER" to open the filter options. 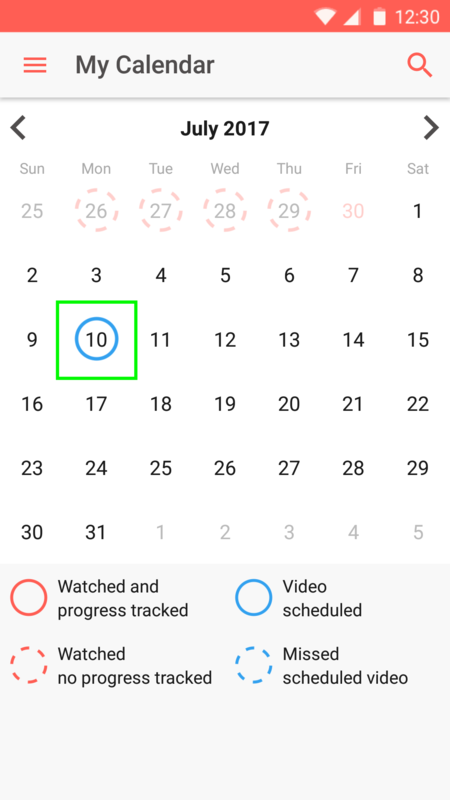 How can I schedule a video to watch later in the Android App? 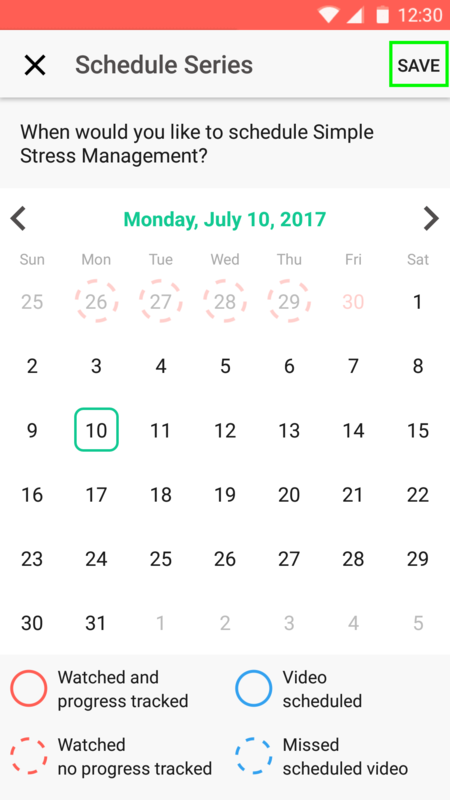 How do I add a program to my calendar in the Android App? Select the "Join Program" button on the bottom of the screen. Follow the instructions to select a time and date to start your program based on your preference. Select the "Save" button to confirm. 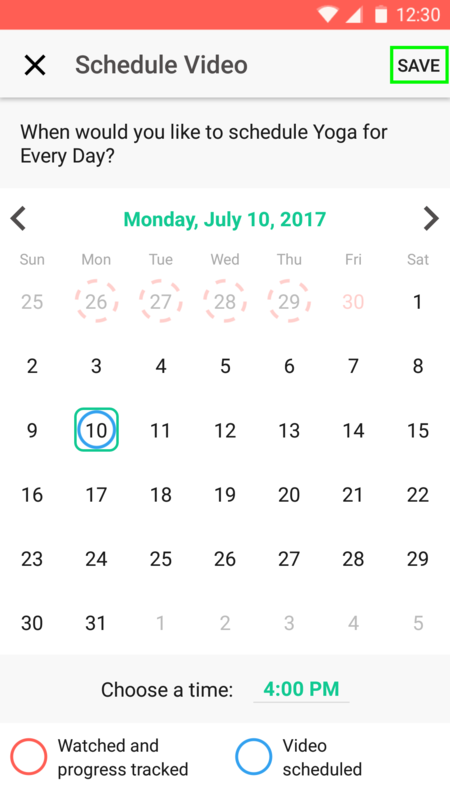 How do I update or delete a calendar reminder from the Android App? 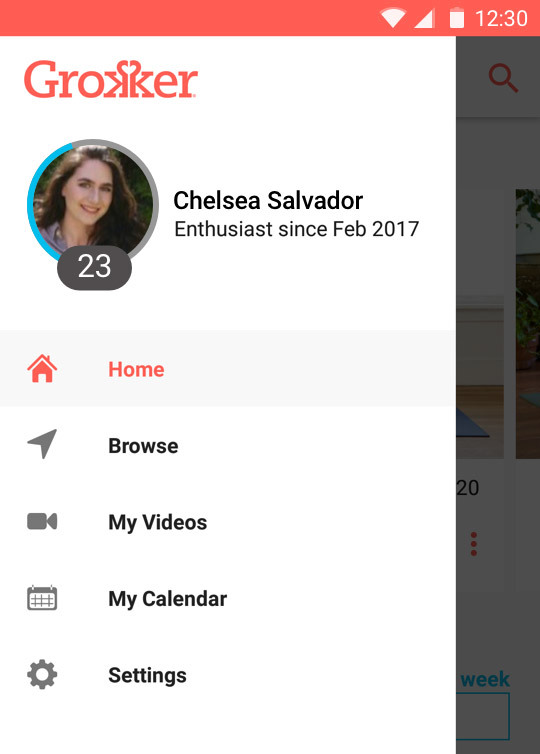 Where can I find my collections, videos I have scheduled, and videos I've watched recently in the android app? How do I subscribe to Grokker from the Android App? To sign out of the app, select "Settings" from the pull out menu, and tap on "Sign Out."